Sleep is a mysterious phenomenon that putatively occurs in all organisms with a complex nervous system. 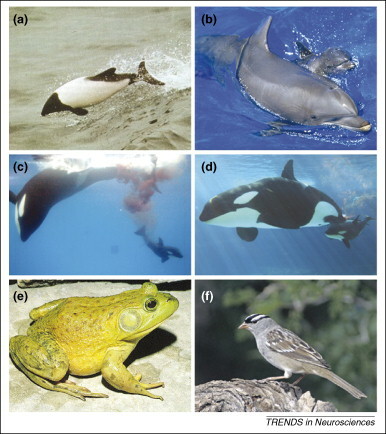 Despite its widespread conservation, sleep properties vary widely across organisms, even those that are closely related. Some animals seem to require long sleep periods, while others can get by with very little. Why this disparity exists remains a mystery. It is important to physiologically distinguish sleep from other similar physiological states. Firstly, sleep is characterized by immobility (or lethargy, in certain species) and greatly reduced responsiveness to sensory input. However, this state is rapidly reversible, i.e. animals can be woken up and be restored to full alertness quickly. This separates sleep from unconsciousness, torpor, and hibernation. Finally, sleep is homeostatically regulated. A decrease in one sleep period causes “sleep debt”, which will cause an increase in the length of the next sleep period. However, this final criterion does not seem to be as strict as the first two, because several exceptions exist in the animal kingdom, e.g. Odontocete dolphins postpartum, certain species of bullfrogs, and migrating birds . In the field of sleep research, there is one central question we want to answer: what are the functions of sleep, and why is it so necessary? When we are deprived of sleep, our brain function drastically decreases. In humans, many debilitating diseases involve either excessive or insufficient sleep, such as narcolepsy or insomnia. Other diseases such as bipolar disorder show abnormalities in sleep patterns. Investigating what sleep is doing to the brain and what mechanisms regulate it is crucial to treating sleep disorders and gaining a deeper understanding of brain function, both in humans and non-humans. Perhaps with this knowledge, we will one day be able to replace the need to sleep altogether and gain access to the one-third of our life that is currently locked away. Narcolepsy is a chronic sleep disorder characterized by irregularity and malfunction of sleep cycles. Excessive daytime sleepiness is one of the leading symptoms of narcolepsy, even if the individual is receiving enough sleep during the night. REM sleep in narcoleptics is regular, but with an earlier onset of 5 minutes after falling asleep. Most people do not experience the REM sleep cycle until an hour or more after falling asleep. Moreover, narcoleptic individuals may experience properties of REM sleep in the awake state, such as hypnagogic hallucinations and cataplexy (loss of muscle tone). The biological marker underlying the molecular basis of narcolepsy is a low or an untraceable level of the cerebrospinal fluid, hypocretin 1, in the hypothalamic neurons. Moreover, the onset of narcoleptic phenotype is strongly associated with the onset of cardiovascular status such as lower arterial blood pressure. [Bibliography item Example15 not found. ]It has been evidenced that specific conditions that are more favourable to the onset of narcolepsy include an increase in an individual’s risk due to certain genetic conditions or to the enhanced autoimmune characteristics of the disease itself [Bibliography item Example7 not found.]. Narcoleptic patients also exhibit structural changes in grey and white matter, including changes in the volume of various brain regions as the disorder progresses [Bibliography item Example12 not found.]. Due to the chronic nature of narcolepsy, patients can be considerably, though not completely cured if an early diagnosis is achieved. 1. Lopes Vesna C, Bayer Laurence, et al (2010) “Elevated Tribble homolog 2-specific antibody levels in narcolepsy patients” The Journal of Clinical Investigation 120(3): 713-719. 2. Scherfler Christoph, Frauscher Birgit, et.al (2012) “White and grey matter abnormalities in Narcolepsy with cataplexy” SLEEP 35(3):345-351. 3. Dauvilliers Yves, Jaussent Isabelle, et. al (2012) “Non- Dipping blood pressure profile in Narcolepsy with cataplexy” PLoS Once 7(6):e38977. Cortical arousal governed by different types of neurotransmitters is known to be associated with wakefulness. (Stahl S.M. New Delhi: Cambridge University Press; 2007. Essential Psychopharmacology: Neuroscientific basis and practical applications) []. The neurochemical mechanism behind the regulation of sleep and wake cycle has been a complex enigma. It is evident that there are numerous wide projections of neurons releasing different types of neurotransmitters and neuropeptides to regulate this intricate phenomenon of sleep in the brain. Inceased attention to discover potential treatments of sleep disorders, such as insomnia, and daytime sleeping or narcolepsy, has been led to extensive researches that have focused on neurobiology of sleep and wakefulness. Although there has been extensive researches that have focused on the brain transitions between a sleeping and a waking state through regulations of neurotransmitters, there is no one universal model of sleep circuit governing the sleep and wakefulness. It now seems that the neurochemistry behind the sleep/wake cycle is based on mosaic of numerous pieces of hypotheses. The current theory describes that there are distinct differences in the active brain processing and the specific neurochemical systems involved in the two states; according to Saper and his colleagues , the neural circuits that regulate sleep and wakefulness are distinct for each state, but is also interdependent. The arousal systems and sleep-promoting systems are mutually inhibited by mutually turning off each other's circuitry. after giving birth, or throughout their lives. a) Commerson's Dolphin. b) Tursiops truncatus, the bottlenose dolphin. c), d) Orcinus orca, the killer whale. e) Rana catesbeiana, the bullfrog. f) Zonotrichia leucophrys, the white-crowned sparrow. In land mammals and birds, a phenomenon called REM (rapid eye movement) sleep has puzzled scientists for decades. It is putatively unique to land mammals and birds alone; reptiles, invertebrates, amphibians, and the like, do not seem to have REM sleep . REM sleep is also called “paradoxical” sleep in the field because its properties are counter-intuitive. In slow wave, non-REM sleep, brain activity is greatly reduced. This matches the organism’s outward inactive behaviour and conserves energy. However, during REM sleep brain activity increases to match or even exceed that during waking. At the same time, motor impulses are inhibited resulting in muscle atonia, a property not seen in slow wave sleep, hence its paradoxical nature . Despite decades of research, the purpose of REM sleep is unclear, especially in humans. Although past research has suggested REM is important for memory consolidation, recent findings have cast doubt on such results. The generalization of REM sleep benefiting procedural and non-REM sleep benefiting declarative tasks is now considered too simple . Even the latest research is conflicted on the functions of REM sleep. For example in rodents, low REM may be associated with high emotional reactivity  and increased cortical excitability . On the other hand perhaps REM has functions that are too subtle for us to detect reliably, especially in humans compared to rats or mice . A major difficulty in finding the putative functions of REM is the diverse heterogeneity in sleep characteristics amongst animals. Thus, properties found in rats may not be generalizable to humans or even mice. 1. Siegel, J.M. Do all animals sleep? Trends in Neuroscience 31, 208-13 (2008). 2. Peever, J. Control of trigeminal motoneuron behavior and masseter muscle tone during REM sleep, REM sleep behavior disorder and cataplexy/narcolepsy. Archives Italiennes de Biologie 149, 454-466 (2011). 3. Vassali, A. & Derk-Jan, D. Sleep function: current questions and new approaches. European Journal of Neuroscience 29, 1830-41 (2009). 4. Rosales-Lagarde, A., Armony, J. L., Rio-Portilla, Y., Trejo-Martinez, D., Conde, R., & Corsi-Cabera, M. Enhanced emotional reactivity after selective REM sleep deprivation in humans: an fMRI study. Frontiers in Behavioural Neuroscience 6, 1-13 (2012). humans: A transcranial magnetic stimulation study. Sleep Medicine 14, 288-92 (2013). 6. Brown, L.K. Can sleep deprivation studies explain why human adults sleep? Current Opinion in Pulmonary Medicine 18, 541-5 (2012). A list of the main effects the lack of sleep can have on ones body. Sleep is a natural repetitive loss of consciousness that is reversible and occurs in all organisms that contain a complex nervous system. In a world that has become fast paced and demanding on productivity, sleep has become a waste of valuable time. However, the deprivation of sleep, either acute or chronic has been shown to cause adverse effects on one's higher-level cognitive capacities, attention, memory and mood. Those suffering from the lack of sleep also show elevations in clinical scales measuring many mental health disorders. Though there is a large quantity of information on the effects of sleep deprivation, little is actually known about the mechanism that causes such symptoms. 1. Killgore, William D. S. Effects of sleep deprivation on cognition. Progress in Brain Research. 185, 105-129(2010). 2. Tempesta, D., Couyoumdjian, A., Curcio G., Moroni, F., Marzano, C., De Gennaro, L., et al. Lack of sleep affects the evaluation of emotional stimuli. Brain Research Bulletin. 82:104-108(2010). 3. Goel, N., Rao, H., Durmer, J. S., Dinges, D. F. Neurocognitive consequences of sleep deprivation. Seminars in Neurology. 29:320-339(2009). Sleep, despite the elusiveness of its function, is a heavily regulated periodic behaviour in animals. Sleep homeostasis is believed to be one of two complementary systems that work to regulate sleep patterns in mammals. The Two Process system  consists of a Circadian (Process C) and Homeostatic (Process S) component. The former regulates the timing and onset of sleep, while the latter determines the amount of sleep, depth of sleep, and is implicated in memory consolidation. As of the present, these two processes are differentially described. The Suprachiasmatic Nucleus, its projections, and associated target areas are well defined components of the circadian process, with a body of literature in anatomy, physiology as well as lesion and knockout studies . In contrast, the homeostatic process is less well defined, but is currently being elucidated by a variety of molecular, imaging, and stimulation studies. The current model of the homeostatic process dictates that a somnogenic substance accumulates in the brain with wakefulness, effectively producing a “drive” to sleep. The best candidate endogenous signalling molecules are PGD2 and Adenosine, both of which produce a strong drive to sleep independent of the Sleep-wake switch . In addition, recent research suggests that sleep induces homeostatic regulation of activity at the synaptic level through global synaptic downscaling . 1. Borbély, A. A two process model of sleep regulation. Human Neurobiology 1982;1:195-204. 2. Saper CB, Cano G, Scammell TE. Homeostatic, circadian, and emotional regulation of sleep. Journal of Comparitive Neurology. 2005;493(1):92–98. 3. Urade Y. Prostaglandin D2 and adenosine as endogenous somnogens. Sleep and Biological Rhythms. 2011;9:10-17. 4. Tononi G, Cirelli C. Sleep function and synaptic homeostasis. Sleep Medicine Reviews. 2006;10:49-62. Student caught performing offline memory consolidation in class. Although the function of sleep largely remains a mystery, it is well recognized that sleep plays an important role in memory consolidation. Those who have had first-hand experience with sleep deprivation can attest to the memory impairments that arise with inadequate sleep. Among many others, structures involved in sleep-dependent memory processes include the hippocampus, mPFC, brainstem, and neocortex. A sleep cycle can be divided up into stages based on characteristic patterns such as neural electrical activity, and can be broadly categorized under REM and NREM sleep. The periods of REM and NREM sleep encompass numerous processes that have been found to be correlated with memory consolidation. Different types of memory (eg. declarative vs procedural) appear to be affected more strongly by different portions of the sleep cycle. While processes such as slow-wave activity and REM activity have been associated with memory function, our hypotheses of the detailed underlying mechanisms constantly undergo revision. Despite the difficulties of trying to understand the memory-consolidating mechanisms employed by sleep, it is worth pursuing in the hopes that these mechanisms may be exploited in order to treat memory deficits, or enhance memory. 1. Diekelmann, S., & Born, J. (2010). The memory function of sleep. Nature reviews. Neuroscience, 11(2):114-26. 2. Silber, M. H., Ancoli-Israel, S., Bonnet, M. H., Chokroverty, S., Grigg-Damberger, M. M., Hirshkowitz, M., Kapen, S., Keenan, S. A., Kryger, M. H., Penzel, T., Pressman, M. R., & Iber, C. (2007). The visual scoring of sleep in adults. Journal of clinical sleep medicine : JCSM : official publication of the American Academy of Sleep Medicine, 2, 121–131. I'll fix it if they don't by tonight. It seems [Bipolar Neuroscience » Sleep Irregularities in Bipolar Disorder] might present an interesting opportunity to link our topic with another group's.